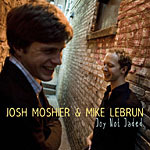 Keyboardist Josh Moshier and saxophonist Michael Lebrun, a pair of Chicago-based jazz artists born in the 1980s, delve deeply into the jazz world with Joy Not Jaded. On this fine, high-energy set, the pair and their band craft a modern-leaning sound that remains true to the post-bop tradition. The set of all original materialfive tunes from Moshier's pen, six from Lebrun'sopens with Moshier's "King's Road," inspired by night drives on Los Angeles freeways (night being the only time any forward momentum can be achieved there). A repeated five-note piano riff introduces the sound that rolls into a smooth-flowing groove supporting Lebrun's round-tone tenor sax. "Avocado Soul," (go figure on the title) meanwhile, is a showcase of the band's ability with a beautifully reflective ballad. A fellow Chicagoan, guitarist John Moulder, joins the core group on Lebrun's "Jambo" (the Swahili word for hello), shaping an ebullient, upbeat ensemble dance vibe that gives way to an introspective sax turn. "Eleven Toe Waggle" features the band at its funkiest, with Moshier's electric keyboard shifting from sparkling to grungy. Call it sparkling grunge. "Known Unknowns" lightens the moods, on a lilting, lovely tune featuring, again, the clean, precise tone of John Moulder's guitar. Joy Not Jaded, recorded in 2009, says that the so-called Millennial generation to which Moshier and Lebrun belong is here. The future of jazz is alive and well in this generation's hands. Track Listing: King's Road; Jambo; Saturnine; The Second Handers; Eleven Toe Waggle; Avocado Soul; Finally Done Still Frustrated; Known Unknowns; Sleepwalking; Misfortunately Pleasant; Who Shall Excel Them. Personnel: Mike Lebrun: tenor saxophone; Josh Moshier: piano, Rhodes, Wurlitzer; Robert Meier: double-bass; Max Krucoff: drums; John Moulder: guitar (2-4, 8).